Actor Simon Callow Discusses "Being Shakespeare"
Simon Callow, the British actor and author, is appearing at the Brooklyn Academy of Music through April 14, and at the Broadway Playhouse in Chicago from April 18 to 29, in a new, one-man play called Being Shakespeare. Written by Oxford University Shakespeare scholar Jonathan Bate, the play is based on Jaques’ “Seven Ages of Man’ speech from As You Like It, and combines Shakespeare’s speeches and poetry with information about his life to create a portrait of the timeless playwright. How did Being Shakespeare come about? I’ve done a series of one-person plays of biographical intent. The first one I did was called The Importance of Being Oscar (about Oscar Wilde). I got my management to commission Peter Ackroyd to write a play about Dickens in the same genre. I commissioned Jonathan Bate, one of the leading Shakespeare scholars in the world, to write (a play about Shakespeare), and he and I sort of sat down and worked it out together. We finally ended up with a play called The Man from Stratford three years ago. We toured that for a long time and then we finally put it to rest in the city of Trieste. We had another crack at it the next year, we changed the title back to the original title, we reshaped it in all kinds of ways and tried to find a different way of acting it. The first version was very epic, but this new version is much more intimate, much more exploratory in a way. It seeks to kind of evoke William Shakespeare, almost like using a Ouija board to kind of pull him out of me. That’s what the show now is. How does this differ from other one-man plays about Shakespeare? I know Ian McKellen’s, which was called Acting Shakespeare, and another by Michael Pennington called Sweet William. Ours is very structured. Our method is this: We’re trying to deal with the man Shakespeare, while Michael and Ian were trying to deal with the work. The way we deal with it is by taking Jaques’ great speech from As You Like It, the “Seven Ages of Man”—that’s the spine of our show—and we work through each of the ages and we ask the question what was it like to be an Elizabethan baby, what was it like to be an Elizabethan schoolboy, what was it like to be an Elizabethan lover, what was it like to be an Elizabethan soldier? If that was the case for most of the people, it must have been the case for William Shakespeare, too. So we try to imagine his life given the bare bones of the facts that we know about it—that he was born in Stratford-upon-Avon, that his mother had lost two children before he was born, that he had three brothers and a sister, that his father was the mayor of Stratford. We approach it from three angles, the general, what we know about the Elizabethan world; the particular, what we know about Shakespeare; and then the plays. What we’ve done with the play is to help make people think about Shakespeare from a slightly different angle. It’s not that we’ve got any great new information about Shakespeare. I’d like the audience to think about what we know a bit more deeply. What Shakespeare have you performed? The first thing that I did professionally was Titus Andronicus, at the ridiculously early age of 37 I played Titus Andronicus and lost my voice immediately. I played Orlando in As You Like It at the National Theater. I played Falstaff in two different incarnations, Toby Belch in Twelfth Night at the National Theater last year by Peter Hall. I played Richard III on the radio, Malvolio on the radio. In that sense, that was a precursor of what we’re doing in this show—in my view, the sonnets are as close to autobiography as we know of Shakespeare’s work. It’s certainly an incredibly intimate record of a long, long passionate journey between two people. The sonnets, almost all of them are addressed to a young man, they’re very passionate poems, they‘re love poems. We don’t know what sort of relationship exactly there was between the two men, whether it was actually a sexual relationship or whether it was merely one of a compassionate friendship. But what we do know is that it describes an overwhelming experience for the poet, which almost blocked him out–a complete, mad, passionate devotion to another human being and the destructive nature of that passion. In our version we identified him as the Earl of Pembroke, other people think it’s the Earl of Southampton. Do you have any particular favorite Shakespearean roles? Falstaff is the greatest part Shakespeare ever wrote. It’s monumental, extraordinarily bizarre, unpredictable, profound, profane, a force of nature. And many actors who have played Hamlet and later in their careers played Falstaff have confirmed that in a way Falstaff is a greater character almost than Hamlet. Hamlet is sort of a mind in action, but Falstaff is flesh and blood, pagan, primitive, amazing, wonderful. What is Shakespeare’s relevance today? In my view, anyway, Shakespeare gives the best account of what it is to be a human being, and that can only ever always be relevant. We want to have someone put our deepest experiences into words and he does it. If you fall in love, if you’re jealous, if you have military ambitions, if you’re political, if you’re a leader, if you’re a follower, if you’re old, if you’re young, it’s in there. In a way, the most important thing I’ve done as a Shakespearean is to have spent 30 and more years performing his sonnets. In 1979 I actually did the unique and really idiotic thing of performing all of them on one day. Subsequently, I‘ve done it all over the place in smaller versions. A couple of years ago in Stratford, Ontario, I did a program called There Reigns Love, in which I performed 88 of Shakespeare’s sonnets. Again, it’s all about content. The sonnets are mysterious, there’s a story there somewhere in the sonnets, but it’s very hard to piece it together. 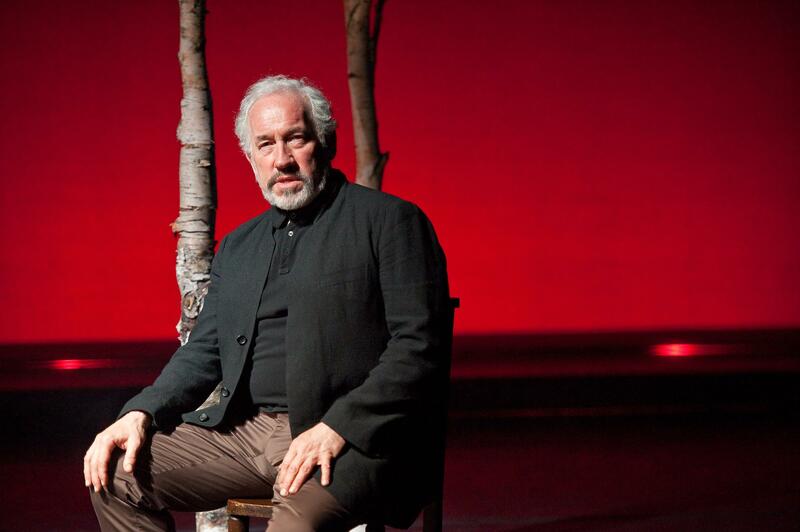 » Actor Simon Callow Discusses "Being Shakespeare"